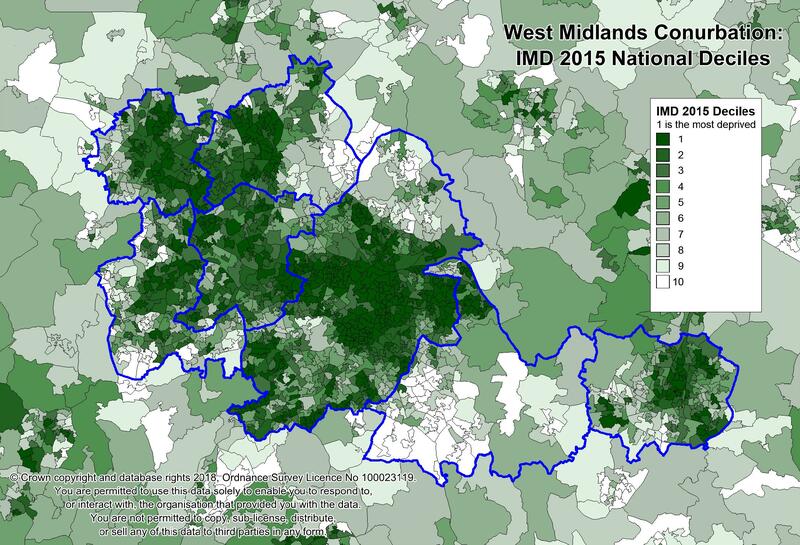 The Indices of Multiple Deprivation (IMD) 2015 shows Sandwell’s average deprivation score as ranked 13th most deprived local authority in England, out of a total of 326. Previous IMD results for this measure show that Sandwell's position has improved slightly relative to other districts in England. Sandwell was 12th most deprived local authority in 2010. Within the West Midlands conurbation there is a central corridor of severe deprivation that runs from Birmingham, through Sandwell, into Wolverhampton, parts of Walsall, and Dudley. The less deprived areas are around the extremities of the conurbation and within the adjoining district of Solihull. Sandwell's location at the centre of this deprived urban area means that the borough does not benefit from having a semi-rural fringe - indeed, Sandwell is the only metropolitan borough outside London that does not adjoin a Shire district. The likely impact of a largely deprived hinterland should not be underestimated as a significant limiting factor on the potential to address some of Sandwell’s deprivation characteristics. England is made up of 32,844 Lower Super Output Areas (LSOAs), 186 of which are in Sandwell. One in five of Sandwell’s LSOAs fall into the most deprived 10% nationally in 2015. This shows a relative improvement, as around 30% of LSOAs were among the 10% most deprived in both 2007 and 2010. A further third fall into the most deprived 10-20%, so overall 55% of Sandwell’s LSOAs fall within the worst 20% nationally, and 86% within the worst 50% nationally, clearly displaying the high levels of deprivation prevalent in large parts of Sandwell.